Lightweight: Aluminum is lighter than steel or fiberglass. This lighter weight equates to less wear and tear on the vehicle as well as improved fuel economy. Insulated: All exterior walls are insulated with a 1” lined insulation. Ventilated: Standard units have operable louver vents on doors for ventilation. Doors include locking latches keyed alike. Wash-Thru: Standard on all units is a 1” opening at the bottom of compartment dividers for wash-thru ability when cleaning after use. 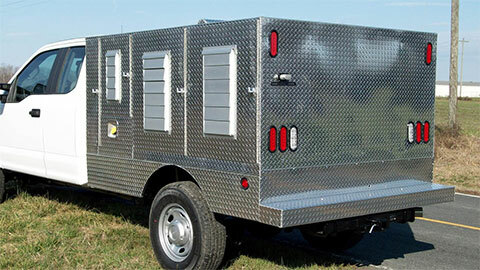 Sizes: All units are available for long wheel base or short wheel base full size trucks. We can custom build to YOUR specifications. Lights: LED Body lights and reflectors per Federal regulations. 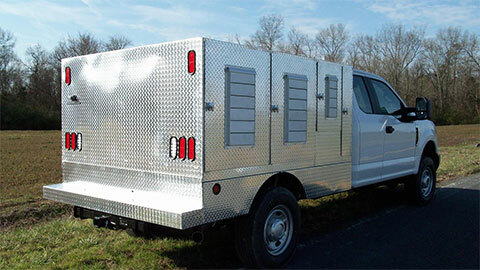 1 @ 9” wide X 40” tall X 78” wide Locking storage compartment on the rear of the unit. 2 @ 21” wide X 27” tall x 39” deep Compartments for cats or small dogs. Solid partition with 1" opening at bottom for wash-thru. 2 @ 31”wide X 40” tall x 39” deep Compartments for large animals. Solid partition with 1” opening at bottom for wash-thru. 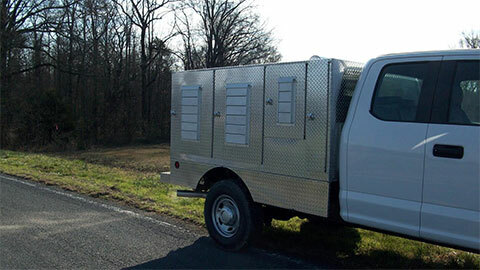 2 @ 33" wide X 40" tall X 39" deep Compartments for large animals. The center divider is hinged so it can be opened to form one large compartment for hauling large traps.